Amy was preparing to teach highschool students anatomy through art. Tom worked on several landscapes. What lovely skies! 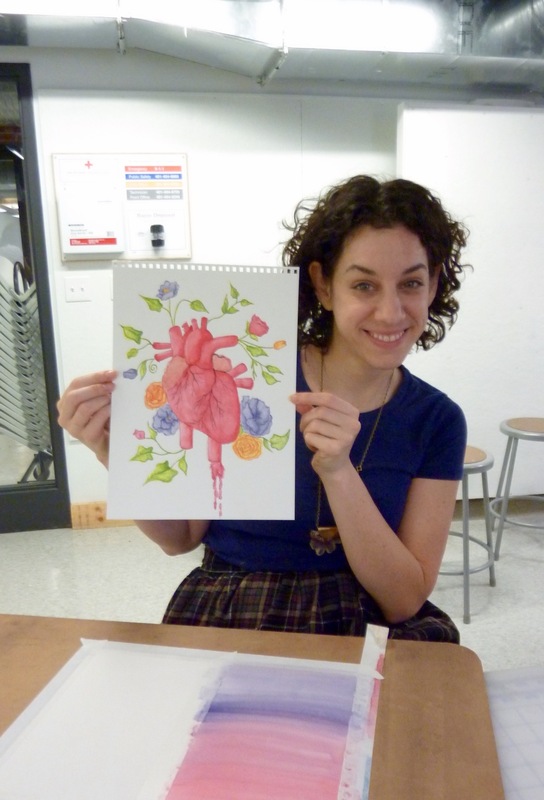 We had a lovely break between snowstorms at RISD for a Weekend Watercolor Intensive Workshop. I had my first class in the newly renovated ISB (Illustration Studies Building), and found the quarters to be quite nice. Eleven students gathered for two full days to learn about and practice using watercolor paints. Their experience ranged from "haven't touched watercolors since 3rd grade" to an illustration major who graduated from Savannah College of Art. On Saturday we did hands-on exercises to learn to handle different brushes, talked about properties of different colors and papers, watched presentations of step by step techniques for layering and laying washes, and more. On Sunday, each student brought in a personal project (or 2 or 3) to work on. Rob pumped out THREE paintings, using layering, wet on wet, and more. Louise worked on backlit sunsets and tropical fruit, employing washes and layering techniques. Add green to red, and you get those deep shadows in the fruit! Mary pushed herself to add more contrasting values to create space. Kay traveled from Block Island to do a weathered scene from Block Island! Yanlin layered many washes for an impressive skyscape. A wooden window with a landscape and revisions on the drawing of the girl to come. Laurel used resists to save the whites in these two illustrations. Dede worked on mixing colors and dropping them to achieve a "glow" in her background. Kristin began work on two illustrations, adding a dreaded background to one. More layering will add form and give the art punch. MaryBeth brought some spectacular elements for a variety of still-life... she did a 4th piece after this that was everyone's favorite. As always, it was an absolute pleasure to spend the weekend with these talented and motivated students!